That's George Ardisson next to Reg. If I had to choose between this film (which I think is a tad overrated) and MACISTE IN HELL (which I think is very much underrated), I would choose MACISTE IN HELL. I like this film but it's a static film. In this movie, Mario Bava's camera is always still and rarely fluid or moving along. I think this style suited his horror films more than action films. Visually, it's interesting but it sorta plods along, which is the opposite of MACISTE IN HELL, directed by Riccardo Freda. Freda's version of Hero-in-Hell story is fluid, dream-like and haunting. Fantoma has done an incredible job of bringing this film to light and I look forward to their Kenneth Anger compilation that is supposed to be coming out this summer. 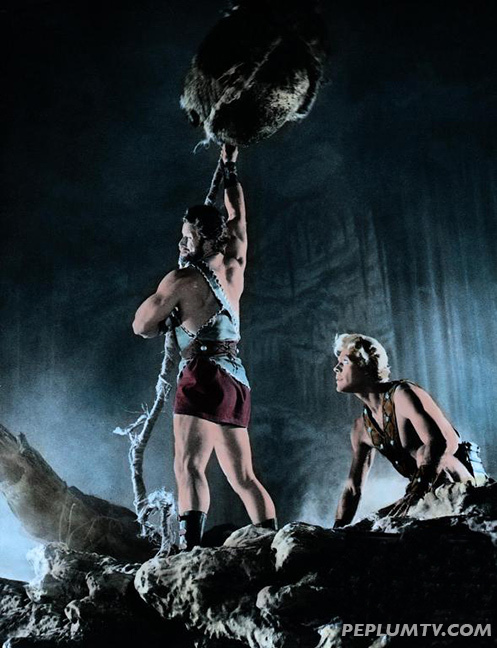 I bought the Italian version of both Maciste In Hell and Mole Men vs The Son of Hercules and it very interesting how the story flows so much better from scene to scene. Although I don't understand Italian, the English script was well-known. The translation seemed pretty accurate. Maciste was almost defeated by Hell until that witch fell in love with him and saved his hands. What good are muscles if you can't apply them without agony?